Summary of today’s show: Scot and Fr. Mark welcome two of the speakers at this weekend’s WQOM 1st Anniversary Conference in Lowell, Fr. 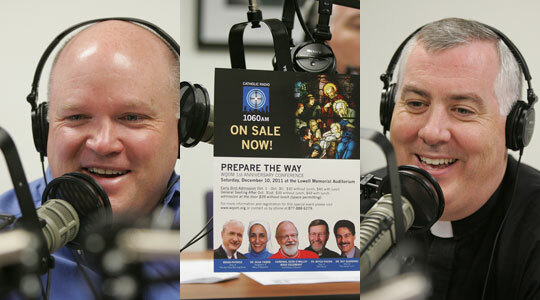 Mitch Pacwa of EWTN and Brian Patrick of the Son Rise Morning Show on WQOM. They discuss the value and importance of Catholic conferences, especially during Advent, to enliven the faith and prepare for Christmas as well as to grow in fellowship with other Catholics. 1st segment: Scot and Fr. Mark talked about their week, including Friday’s Mass of blessing for the new community of women with Sister Olga at the Cathedral. There about 800 people coming. Fr. Mark said Sr. Olga is a very well-known and memorable person who has touched the lives of many people. Scot said on Saturday, more than 1,000 people will join WQOM in celebrating the first anniversary of Catholic radio in Boston at the Lowell Memorial Auditorium. Scot said he loves conferences. He was very involved in the Catholic Men’s and Women’s Conferences in the past and will be the emcee tomorrow. Tickets will be available at the door. It runs from 9am-5pm and will end with a Mass with Cardinal Seán for Gaudete Sunday. 2nd segment: Scot and Fr. Mark welcomed Brian Patrick to the show. Scot said WQOM listeners wake up each day to learn about the Catholic faith listening to the Son Rise Morning Show, which originates out of Cincinnati. Scot asked Brian why it’s good for Catholics to come to a conference in Advent or Lent. Brian said on Saturday he will talk about Advent as a time for a new beginning. The season of Advent is the beginning of the Church year. Especially with the new Mass translation, it’s a new beginning even more this year. Fr. Mark asked how a conference can touch a person individually. Brian said he starts by preparing his own soul for the coming of Christ and then sharing with others his passion for Christ. Brian said he was away from his faith for many years, but he came back to Christ on his knees and realized that the Lord loved him through all those years and gave him a new beginning. Now he gets to share the Good News of Jesus Christ with people all over the world every day. So he will share his own experience and those attending will share their stories with one another. When we can share what we’re going through, it prompts us along the journey. Scot said Brian said Advent is a great time to slow down, but the Christmas shopping frenzy can take us out of it. Scot said he likes an Advent retreat as a way t o step back and not get caught up in that to marvel at the Incarnation. This conference can help make Christmas more special. Brian said the culture wants us to buy in to the idea that we need to make sure the retailers have a good Christmas. But Christmas is focusing on Jesus who comes to us in the Nativity. He loves to give Christmas gifts, but he keeps them personal and simple and refuses to buy into the prevalent idea. Thank God for Catholic media that reminds us of the true reason for Advent and Christmas. Scot said the conference will be a chance to say thank you to The Good Catholic Life listeners. Brian said he loves meeting his listeners. Each morning he thinks of talking to one person because it’s a personal meeting. To see the faces and meet the personalities, he then begins to picture them personally. Brian said they are privileged to have a 24-hour adoration chapel in the building where Son Rise Morning Show is broadcast each day. Fr. Mark asked Brian if he could think of a time when a conference has truly borne fruit. Brian said with the Crossing the Goal team he has attended many men’s conferences and he has been moved by the fact that men and women are coming back to the reconciliation. He is moved to tears at men’s conference to see lines of men going to confession to dozens of priests giving up their days to give the sacrament. Eucharistic adoration is a big part of the conferences too and to see 1,000 men on their knees adoring Christ is moving. Brian said invitation is key. We are called as disciples to invite our brothers and sisters to come back to Church. And when we invite them, we have to be willing to hear yes or no. Inviting someone to a conference opens the door to inviting them back to the Church .He encouraged everyone to invite at least one other person to come. Brian said Dr. Ray Guarendi uses humor to get our attention for a powerful message. He and his wife have adopted 10 children, some special needs. He’s extremely funny and entertaining. There is a powerful message there. Fr. Mitch, too, is a brilliant teacher who speaks several language with a way of sharing the faith at a level that everyone can understand. EWTN first picked up the Son Rise Morning Show about 3 years ago. The show started 4 years ago and Sacred Heart Radio in Cincinnati started 10 years ago. He said getting on the Boston radio market last year was great and he’s very grateful. Brian said last time he was in Boston he had the best seafood meal ever at Anthony’s Pier 4. Fr. Mark asked Brian for his recommendation to the hosts of The Good Catholic Life to keep it fresh and always new. Brian said our faith is always fresh and new and there are so many wonderful people out there. He learns every day from the people he talks to on a regular basis, that he has on the show all the time. Always remember what’s old is new. We are a universal Church that includes the faithful of all time so he advises to tap into this immense treasure of faith and wisdom. Son Rise Morning Show is on the air every weekday from 6-8am on WQOM. 3rd segment: Scot welcomed Fr. Mitch Pacwa to the show. He hosts several EWTN TV shows and is a speaker at the WQOM conference in Lowell this weekend. Scot asked Fr. Mitch why it’s important to attend Catholic conferences in the seasons of Advent and Lent. Fr. Mitch said in recent years people have not been well-catechized and don’t know enough about their Catholic faith. These are opportunities to help people know more about what’s going on in their faith. In his experience, people know their Catholic faith when they hear, but don’t know how to put it into words. We live in a time when it’s important to be able to explain the faith. There is a significant amount of anti-Catholicism. We have a number of people who dislike God and the Catholic Church, in particular. We need to be able to put our faith into words to give them an answer. In 1 Peter, chapter 3, We should always be ready with a reason for our hope in Jesus Christ. Many in our culture do not have a lot of hope. The Catholic faith is there to give a reason for hope. Scot said, going to large Catholic conferences, one can feel it’s tough to live the faith in daily life and seeing hundreds or thousands of like-minded Catholics at these events can inspire us and transform us and energize us to transform society. Fr. Mitch said some who try to discourage us from having faith often assume we won’t be able to meet with each other, know each other, and find out the cool things that are happening in the faith. We need to help each other find out we’re not alone. Scot said Fr. Mitch has led pilgrimages to the Holy Land and trying to put ourselves in the mindset of Nazareth can help us deepen our faith. Fr. Mitch said he has taken 55 groups of pilgrims to the Holy Land and he has found that you realize that the facts of our salvation did not occur in some theme park, but in a concrete place where life goes on and there are people still living close to the land. He has had the experience of pilgrims saying to him that when they go home and hear the Gospel read, suddenly it all comes to life. That is a very positive experience. Scot said St. John Baptist was always asking us to be ready for the coming of Christ. Fr. Mitch’s talk on Saturday is titled “Prepare the Way for Christ.” Fr. Mitch said one of the things he’s doing now is getting ready for the Year of Faith next October as declared by Pope Benedict. He would like to talk about the important role of faith. Faith is not just a psychological state; it’s a commitment to the person of Christ. We are in need of hearing Jesus ask us to make the act of faith in him. The more you read the Gospel, the more he evokes a response of faith (or in some cases, a rejection of faith). Scot said one of his favorite Scriptures is “Who do you say that I am?” Who do we say Jesus is during this Advent in 2011? Fr. Mitch said what we respond with is a statement of faith. If we have faith in the fullness of what he revealed about himself then our act of faith means … In the Baltimore Catechism asks “Why did God make me?” The answer is the ultimate answer to life: “God made me to know, love, and serve him, in this life and to be happy with him in the next.” That is why we exist. So many people are running from one experience to the next where they’re trying to find relief from pain or fleeting moments of pleasure, where they don’t have an overview of the purpose of life. Our faith in God tells us he is there to give us that overview. He is why we exist. Scot asked Fr. Mitch what it’s like for him, where he has a very large audience, to come to a conference and meet people in person who watch his show or listen to his radio shows. Fr. Mitch said it’s great to get to meet the people and get their reactions. When he comes back from conferences, he’s often thinking of the individuals he’s met. He just came back from vacation in Texas and met some people who have an apostolate in a high-security prison and they told him how the prisoners listen to EWTN radio and 92 of the prisoners are presently in RCIA. It helps him to think and be sensitive to a group he doesn’t think about unless he goes out and meets folks, to talk to them about their experience. Fr. Mitch knows he now needs to do a shout out to them to let them know that we’re thinking about and praying for them. Scot said prison can be a fertile time for people to meet Christ again or for the first and begin a lifetime of ongoing conversion. Scot said this conference is also a celebration of one year of Catholic radio in Boston. He asked Fr. Mitch why Catholic radio is doing so much good. Fr. Mitch said radio is a great medium in the daytime when people are at work or driving. Once, when he was in Seattle, a person had seen a bumper sticker for Catholic radio while he was driving on his way to commit suicide. He tuned into the station, it changed his life and he became a Catholic. This is just one story. He’s heard others about women changing their minds about having abortions and others like that. For most people it helps their faith, but for some it saves their lives. It is an incredible privilege to be part of this medium. Scot said this Sunday is Gaudete Sunday, which is driven by the second reading. Scot said Gaudete is Latin for “Rejoice”. Priests will wear rose-colored garments. Fr. Mark said he doesn’t know why they wear, but all he knows is we don’t call them pink. St. Paul tells us that God’s will is to rejoice, pray, and always give thanks. Fr. Mark said the first reading is split in two: In the first half, the anointed one speaks and in the second, Zion responds. Our response can’t help but be rejoicing. He said seminarians are often told, if you’re going to preach the redemption, look redeemed. Scot said we should respond with rejoicing in the Lord. In my God is the joy of my soul. Joy is the hope of knowing that God loves and protects us and gives us what we need. Advent prepares us this third Sunday by focusing on joy. In Advent we think about the first coming of Jesus as the nativity and the second coming at the end of time. In those times, we rest in the hope of God’s desire to pour out his love for us. Fr. Mark pointed out a third coming of Jesus, his coming in a new way at this Christmas. Scot said we’re not called as adults to be blind in our faith, but we should ask and delve deep and ask questions. Scot said in the Gospel people ask John the Baptist who he is and he responds by saying who he is not. Then he identifies himself by quoting Moses. We are John-like because we can point others to Christ and get out of the way.